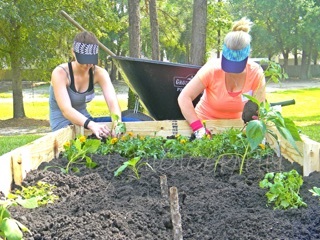 Sangaree Library is proud to present the completion of its community garden project as a result of volunteers from the community on June 6, 2015. The Sangaree Library is excited about its Community Garden Project, which it has been able to do as a result of a Community Grant from Home Depot and the support of the Sangaree Special Tax District! The library’s goal is to provide a positive opportunity for community members of all ages to interact with each other while giving back to their community. The Sangaree Library has successfully done two smaller building projects, specifically working with teens. These include a Little Free Library (littlefreelibrary.org) and the Awesome Box (awesomebox.io) to help build a relationship between the library and its teen users. The Sangaree Library hopes to foster that relationship by continuing to increase the involvement of the teens within this community in order to help decrease the amount of vandalism in the area. 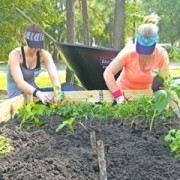 This garden project seemed like a perfect opportunity to give back while also providing a chance for the teens to interact with other local residents in a positive way. 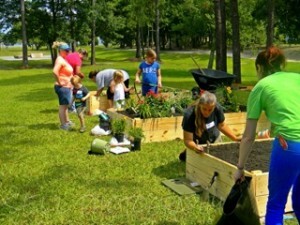 The original plan was to assemble, fill and plant three raised beds with the help of community participants on Saturday, June 6, 2015. The library was amazed at the amount of support it received on that Saturday. In fact, so much so that volunteers pooled together additional resources to expand the project to 4 raised beds! There are now 2 raised vegetable beds, 1 raised pollinator bed, and 1 raised vegetable and pollinator bed. The produce from the garden will be donated to local residents in need. The Sangaree Library gives a huge thank you to all of the community participants who stopped by on Saturday to help and have made the project a reality. Thank you to Makeda Brown and her company, S.E.L.L. Photography, for providing the photos. 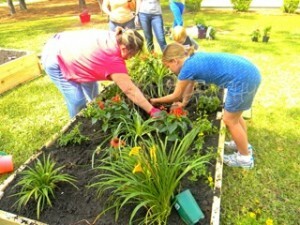 The Sangaree Library continues to need the help of the community to keep these gardens growing. Anyone who would like to help maintain the garden beds is welcome, and the library will have tools at the library that volunteers may borrow. Anyone interested in volunteering on a regular basis to help with the garden or who has any questions can stop by and speak with Rieta Drinkwine, the Branch Manager, or contact her at 843-695-1208 or Rieta.drinkwine@berkeleycountysc.gov.